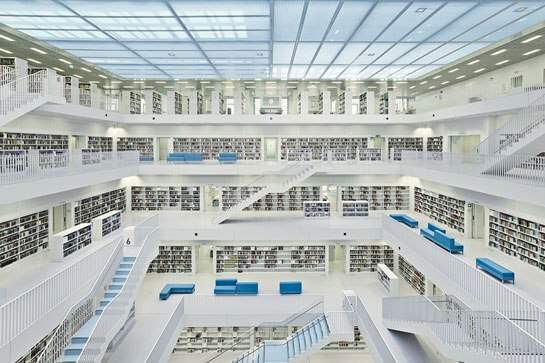 A stunning, though at first glance simple, library has risen in the German city of Stuttgart. Designed by Eun Young Yi, principal of the Cologne-based firm Yi Architects, the building presents itself as a single cubic volume. But what appears to be an unremarkable shell of glass bricks and concrete is, in fact, a second skin enclosing promenades that circumscribe the entire structure. Come nightfall the façade glows from deep within. More magical still is the interior, which features two atria, one stacked above the other. The lower is a soaring ascetic chamber, empty but for a small fountain. (The cavernous room’s scheme was inspired by the Pantheon in Rome.) Upstairs, a five-story space, shown, gleams with natural light, thanks to a glass ceiling, polished white surfaces, and stepped balconies. Could there be a better place to read?